The fight will be the American’s last before he serves a three-month jail sentence for domestic abuse. FLOYD MAYWEATHER JR. has been doing this all his life, since he was a scrawny kid seeking solace in the gym. The ring is his comfort zone, and he’ll enter it Saturday for the 43rd time as a pro, certain as ever that when the night is through he’ll not only be a lot richer but still unbeaten. Miguel Cotto is certain of a few things himself. Certain that he has conquered his worst fears in boxing, certain that he can be the first one to conquer Mayweather. Not many are, especially the oddsmakers who make Mayweather a 6-1 favorite in Saturday night’s fight. But if any fighter is a live underdog it’s Cotto, a relentless puncher who believes in himself again after finally avenging a beating he took from Antonio Margarito four years ago that left him searching for answers about his chosen profession. Mayweather has answered that question every time he’s stepped in the ring as a pro, winning all 42 of his fights while becoming the biggest pay-per-view attraction in the sport. If he needs any added incentive to win this fight, it would be that it might make the nights pass easier when he goes to jail June 1 for what is expected to be a two-month sentence for domestic abuse. There are still questions, though, about why Mayweather doesn’t fight Manny Pacquiao in the fight most boxing fans want, a fight that would be the richest in boxing history. Mayweather answered them in part earlier this week with a lengthy rant about how he believes Pacquiao uses steroids and that he wouldn’t want to risk his health against him. Mayweather continues to insist he doesn’t need Pacquiao, and he may be right. He gets the biggest cut of the revenues for all his fights, and he’s guaranteed to make at least $32 million for this one, while Cotto will pocket $8 million. Mayweather may not be doing boxing any favors by not giving the sport a desperately needed fight, but he’s doing fine for himself. Despite the odds in his favor, there’s a decent chance Mayweather could be challenged by Cotto, who will be fighting at 154 pounds for the fourth time and appears to be comfortable at the weight — which is the class limit. Mayweather agreed to move up from 147 pounds — he weighed in at a 151 pounds Friday, his highest ever — to take Cotto on in a scheduled 12-round fight from the MGM Grand hotel that will be televised on pay-per-view. Most in boxing, though, believe Cotto (37-2, 30 knockouts) is too slow for the slick Mayweather and will be unable to apply enough pressure to land effectively and often. They believe if he cannot get inside he will be easy pickings for the 35-year-old, who in recent fights has shown an inclination to fight more flat-footed rather than try to win by playing defense. Email “Mayweather takes on Cotto, vows to remain unbeaten”. 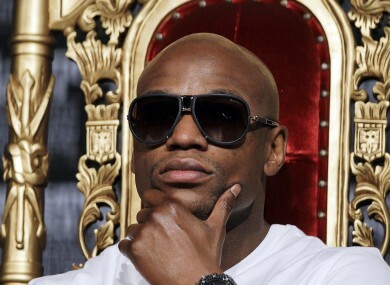 Feedback on “Mayweather takes on Cotto, vows to remain unbeaten”.